Wouldn't you know it that 2012 is a leap year so I have one extra day to work at being truthful! (I will probably need the extra practice.) I started out my year of truthfulness and so far so good, but then I only been home and gone to church services. 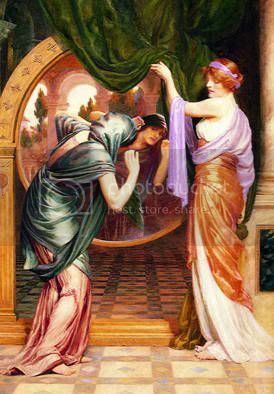 I will say that making a promise to be truthful is like looking myself in a mirror examining everything I say for any speck of untruth all the time. This could be a very long year. I am not sure I like what is being reflected back at me now, but then lies do reflect back on us all. Maybe, I just cleaned up that mirror so that I have a clearer view of the things I really did not want to see. Yes, it is going to be a very interesting year and one I hope brings some serious and lasting changes in me. For any such change to begin, I have to be truthful with myself, brutally truthful...well, maybe it just feels brutal. Speaking of mirrors in a differing light, I have noticed that my daughter is often mirroring the things I do. She has been correcting me--not that I correct myself, but that I am often correcting her. She is also correcting her father, which he does not tolerate at all. We both came from an era when it was considered disrespectful for children to correct or argue with their parents. Although her generation seems to be encouraged to do both, she is not being raised in schools but by her very involved, homeschooling parents. I do encourage discussion, but not disrespectful behavior. I explained to the Princess last night, again, that she will be corrected by her father and me, because we are teaching parents all the time. There is no school bell and class is never over. However, she is not to correct us--at least, not all the time, over everything. We would probably be more lenient if she would just back it off a bit, although we did not tell her that part. However, the poor girl may be the victim of genetic engineering, because I was like that with my own mother, probably worse...to be truthful. This mirror of truth is already beginning to make me feel uncomfortable and I have 365 days to go. Oh Seeking! You do do it to yourself! How wise I was to refuse your kind invitation to join you on this journey. I am practically weeping from a mixture of emotions: hilarity; fear; trepidation; anxiety; anticipation....oh my. It will be a very interesting year! Jane: It is nice to see you back to blogging. lol Not really, I'm doing the fasting. Will prob end up in exactly the same place. You are funny. Besides, as stated earlier: What is truth? Oh my. Locked up in bed for 2 days & I'm a nut case! Best of British with it anyway. Ganeida, I think you have a more complicated perspective on truth than I do and that is just so odd to me! However, this is my answer to your question at this time: Truth is what I am seeking to experience. I figure one complicated friend is generally enough so I try to keep me simple & leave the complica tions to you but this time I just can't get a handle on what is obviously simple & straightforward to you. I shall be interested to see where this takes you.